Very bright, full bilingual and finally able, through corrective surgery two months ago, to begin to overcome the childhood handicap of badly burned and deformed hands, Liu, now 27, from a small village in China and with a 5-year degree in clinical medicine, has just landed her dream job as a bilingual medical consultant and staff instructor at a top-tier hospital in southeast China. But, despite the otherwise perfect job fit, there has been a looming problem—one that if unaddressed could jeopardize what should be the start of a very promising career: She’s been afraid of team work. The problem is that Liu, shy, cautious, diffident and somewhat introverted (in part, because she has felt physically different from others)—but now expected to work with a team, has been worried she won’t be able to function as a “team player”, since, in her socially limited life, she has never felt she has been a part of anything outside her home, despite having been in the midst of a lot. So, Liu has imagined she faces an awful dilemma: To pretend she has “team spirit” and to therefore feel miserably dishonest, horribly uncomfortable and inauthentic, or to risk compromising and jeopardizing her work performance and the job itself. However, despite her very special personal history and distant culture, what she perceives as her personal dilemma will resonate very close to home for many employees and job applicants around the world—including those whose life advantages starkly contrast with her disadvantages and hard challenges. From the age of three, when, as a curious child left momentarily alone in her village kitchen, she placed her soft tiny hands on the glowing grating of a searingly hot home wood stove, Liu has felt different and separate from others. At the opposite end of the experiential spectrum, but at the same point on the emotional scale, are some who, for reasons completely different from Liu’s, e.g., belief in their superiority (of intellect, status, judgment, etc. ), a desire to be “special”, or an intense desire for autonomy, as well as a general distaste for groups or for being outnumbered, will also be highly disinclined to yield center stage to any group that would absorb them. What equalizes them and Liu is their shared unease at the prospect of trading their existence apart from others for one in which they are defined, perceived and presented as a part, as though these two ways of being were absolutely mutually exclusive. Although Liu’s personal physical challenge that has contributed to her sense of being different and separate is uncommon, it seems that her reluctance or inability to feel she is truly a part of something, including a work group, is not. In our very recent conversation, what Liu initially didn’t realize is that there is a huge difference between being a team player and being a team member—but a difference that is not the difference others commonly and conventionally see, namely, the distinction between merely, nominally and perhaps perfunctorily being on a team (being a “team member”, including being a “slacker”) and being a dedicated, hard-working team member (being a “team player”). Seeing the difference in that conventional way wouldn’t have helped Liu, since her challenge has not been to accept merely being assigned to a team as a member (which, for her, is a purely administrative detail); nor is it the challenge of doing a good job for and with others, since she is highly motivated to do so, including diligently helping colleagues. Instead, her hurdle has taken the form of what she sees as a burden of unacceptable “emotional labor”—having to actually or seemingly feel emotionally connected to and defined by the team and its members, and to have to behave in ways, such as habitually smiling or otherwise socializing, that communicate this sense of emotional bonding expressed or felt as a corporate or organizational “we”. It’s what Jean-Paul Sartre called “existential bad faith”—faking a job or social performance and thereby evading the choice and responsibility to be one’s authentic self. Paradoxical though this sounds, it makes very good sense once the emotional labor factor is considered, for then what this maxim can be taken to mean is that you can try to contribute both tactically and strategically to the performance goals of a team without performing (including faking) any unpleasant stereotypic or other emotional labor otherwise conventionally expected of a “team member”. In the simplest terms, you can help your team without necessarily feeling or pretending to feel you are emotionally or existentially a part of the team. That is the resolution of the dilemma that Liu and people like her have thought they have faced. If the job really does require such demanding and difficult emotional labor, it probably isn’t the right job for you. But don’t automatically assume that it does. After all, in very many workplaces and jobs, team substance doesn’t require “team spirit”. Successful work contributions and outcomes as an individual self-defined as “apart from” the team can comfortably coexist with team and project contributions and outcomes—especially if you don’t wrongly assume they cannot be reconciled and needlessly put yourself into an emotional and professional bind with respect to your job. 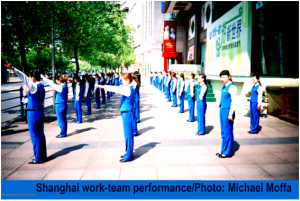 When I broached this distinction to Liu, her relief was evident: Now she believes she can try to be a team player—dedicated to helping her “team” succeed, without being forced to emotionally (appear to) redefine and submerge herself as a team member. Like professional actors, she and others like her can play their professional parts on the same work stage, but, unlike real actors, without having to pretend as well as perform.